Discover more about selected highlights of SCIA Engineer features below. 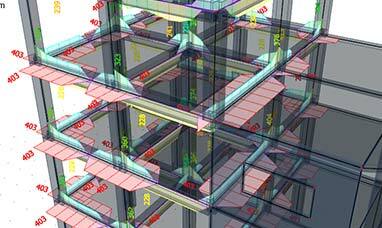 SCIA Engineer provides an intuitive way to work with structural objects. 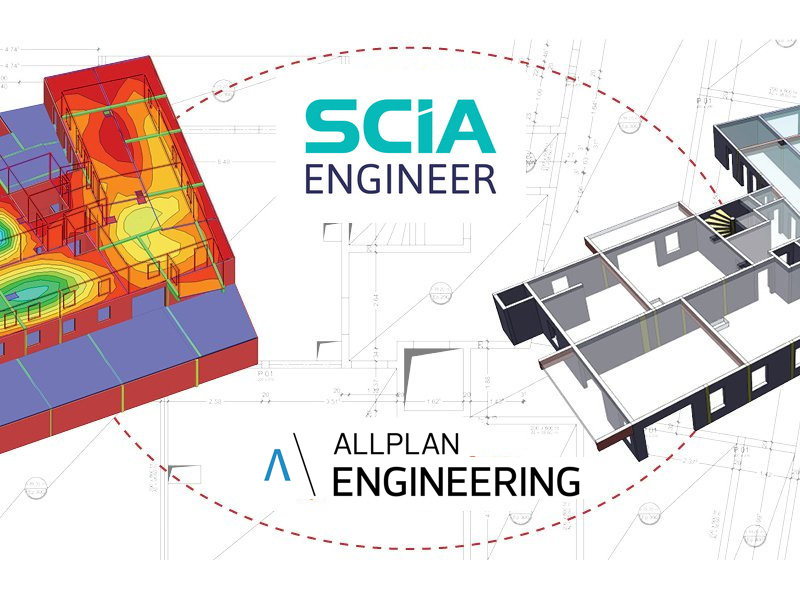 Unlike traditional software tools where you need to work with individual nodes and finite elements, SCIA Engineer allows you to define members with just one click or sketch complex curved shells just as easily as in today's CAD and BIM authoring tools. ﻿Curved beams and shells with constant or variable thickness, can all be easily defined through the modification of simple properties. Additionally, intersections between surfaces can be automatically generated and used as a basis to create cut-outs. This makes it easy to model complex geometry compared to more traditional finite element design tools. Any number of grids can be used in the project, activated or deactivated, and freely rotated. 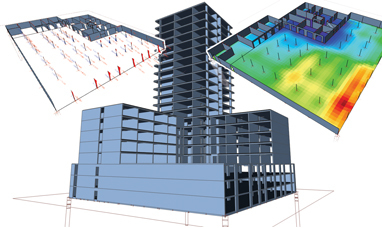 In the case of multi-story buildings, Stories will enable you to better navigate your model, quickly switch from one floor to another and to visualize results per floor. 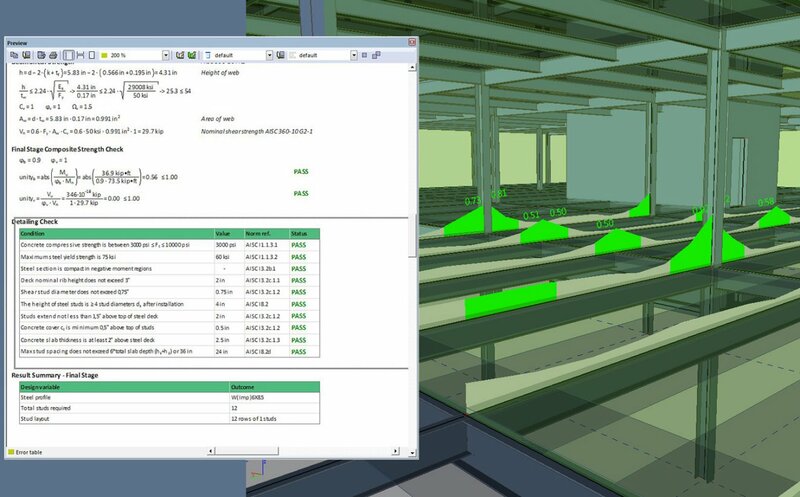 By selecting a single item, one can easily filter all other items in the model that share a similar property. Work with just a portion of a project active on screen. This filtering can be done based on layers in the model, on proximity to workplanes, on clipping boxes, etc. Selected elements can be saved, edited and reused at another time. 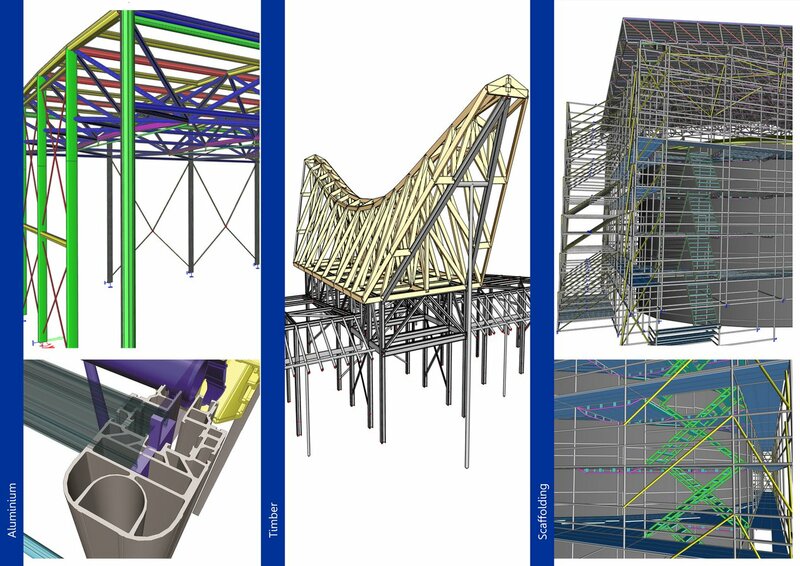 ﻿Parametric modelling allows users to actively adapt the model in order to quickly create design iterations of either repetitive or complex structures. 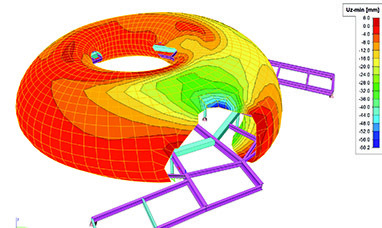 Parametric models are generated by establishing parameters, which can include any model element or property (coordinates, dimensions, cross-sections, materials, loads, etc.). 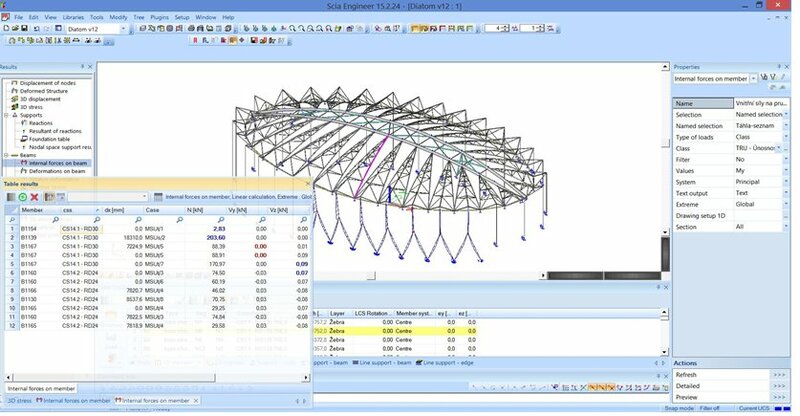 Finally, parametric templates can be established in order to allow users to create or modify projects by utilizing predefined objects, thus creating great efficiency in the modeling process. 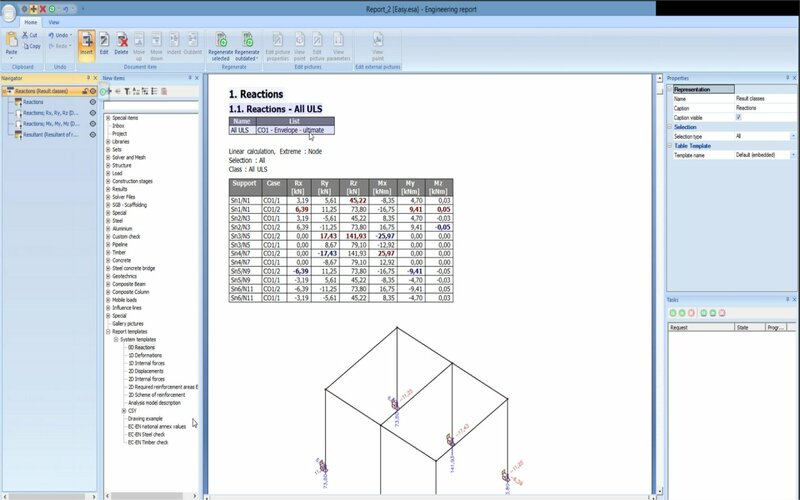 SCIA Engineer will automatically generate and apply 3-dimensional wind loads to your entire structure according to the provisions found in the Eurocode 1 and ASCE 7-05/7-10. 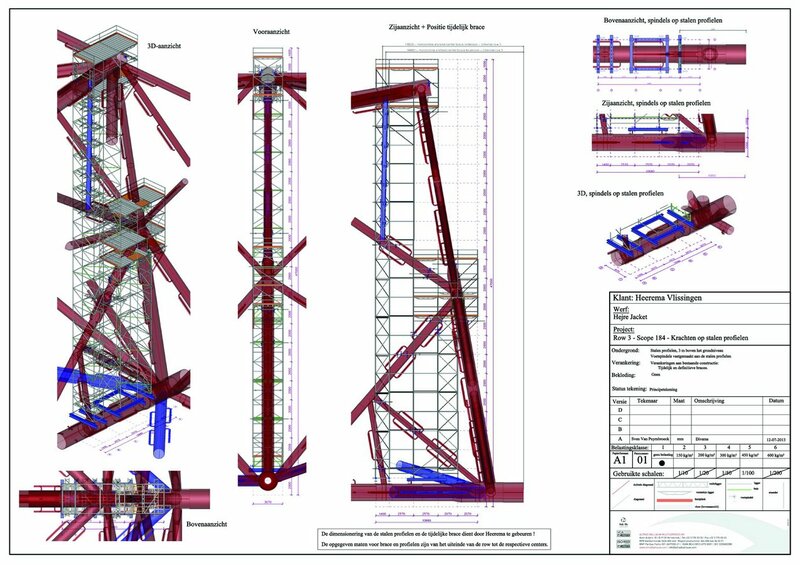 For the ASCE, both the Directional (All Heights) and Envelope (Low Rise) methods are supported for automatic generation of load cases (including torsional cases) on enclosed and partially enclosed structures. 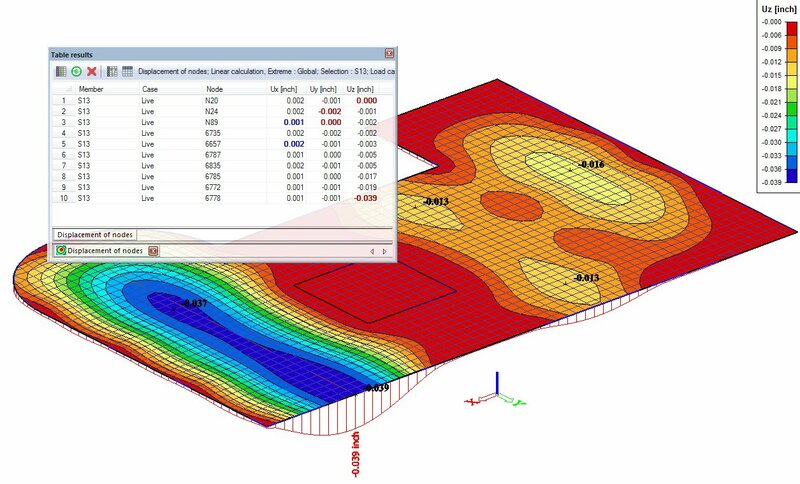 Furthermore, SCIA Engineer’s graphical interface allows users to easily review and verify the pressure coefficients and surface loads being applied to various locations of the structure. Free loading allows users to create loads which are defined independantly of the structure's geometry or meshing, creating flexibility in a variety of load applications. The range of uses for free loads includes: equipment load on slabs that will be perfectly mapped to the underlying mesh, hydrostatic loads on complex shells and user defined wind pressure. 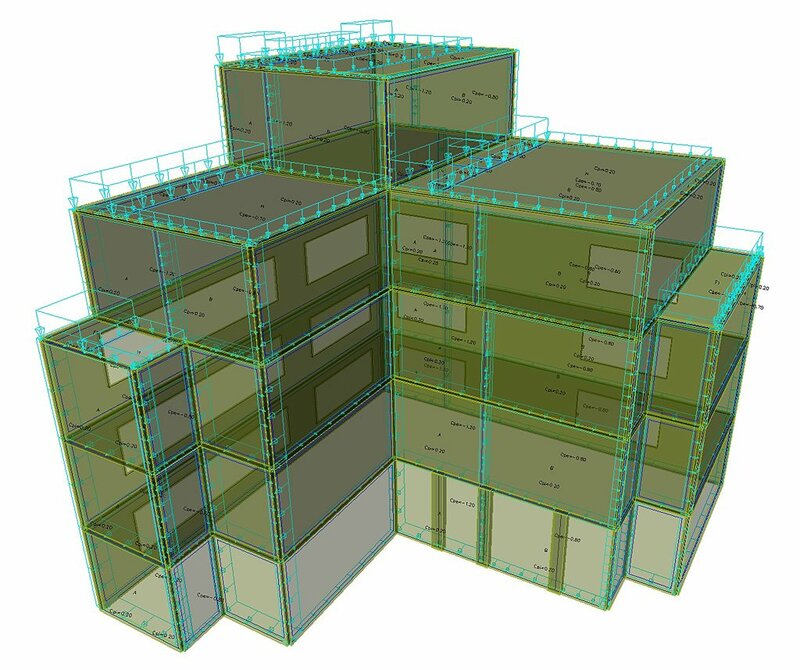 SCIA Engineer lets you model all standard load types: concentrated and distributed forces, moments, support settlements and thermal loads visually as objects. These load objects can then be moved or copied to other members or other load cases while also easily being filtered and modified through the property window just like any other data in SCIA Engineer. 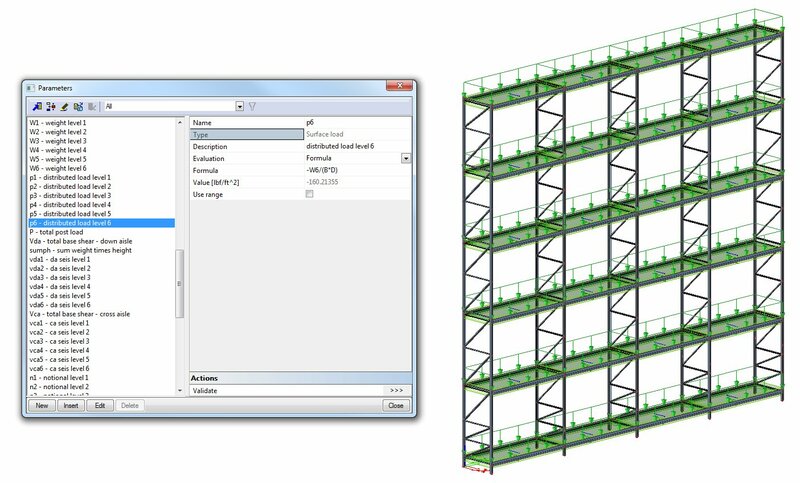 Load Panels in SCIA Engineer are used for the specific task of distributing applied loads to the structural elements of the model. In most applications, load panels represent façades or other non-bearing structural elements. SCIA Engineer utilizes these elements to distribute load using 1-way or 2-way action before analysis, allowing for a reduction in model size, improvement in calculation speed and an increased transparency in applied loads and results. 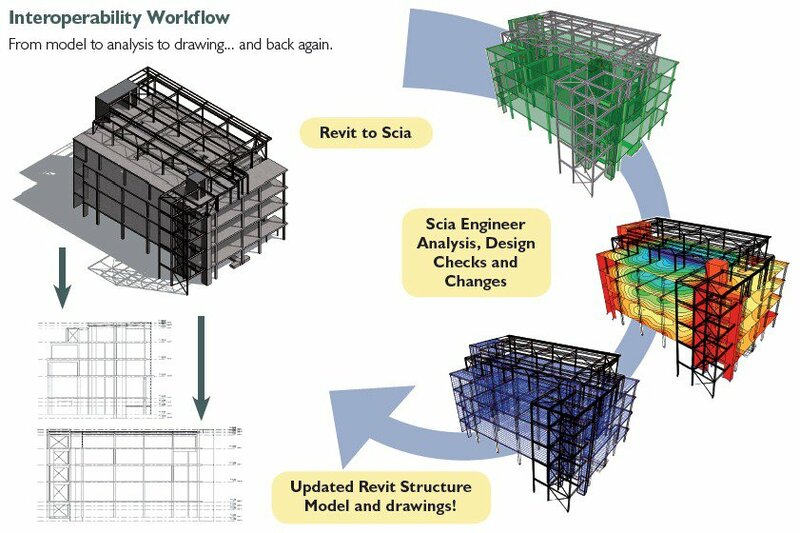 Furthermore, SCIA Engineer’s graphical interface allows users to review and modify the generated loads being applied to various locations of the structure. 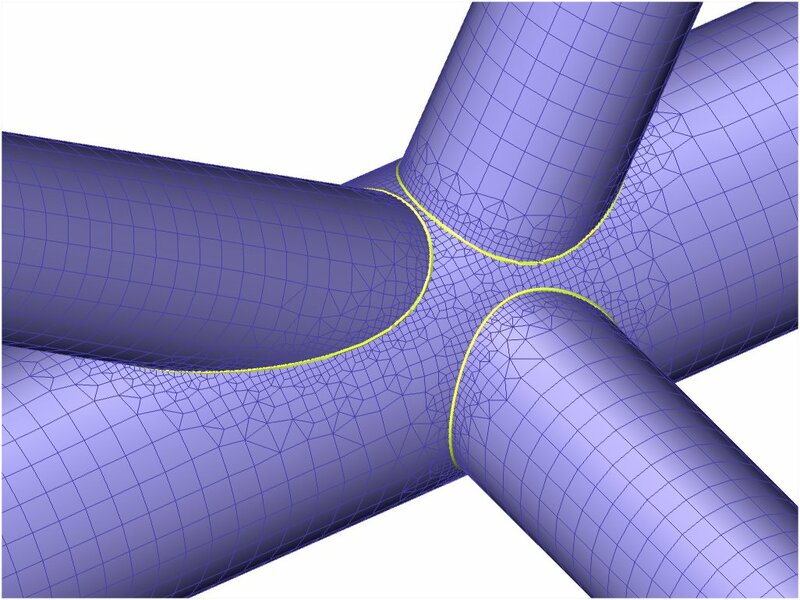 ﻿SCIA Engineer’s meshing will make sure that the transitions between complex surfaces or various mesh sizes is always smooth, guaranteeing quality results from the finite element analysis. 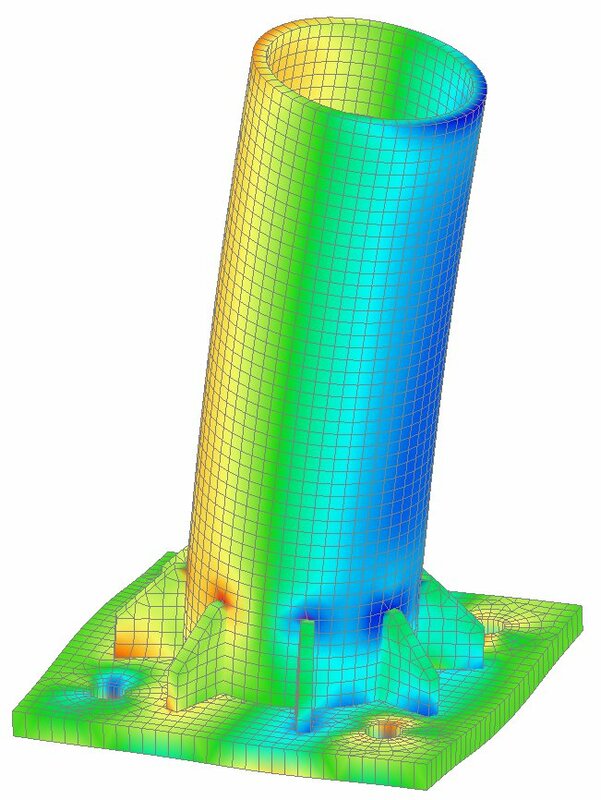 Automatic generation of finite element mesh, based on user defined global mesh settings that is consistent and error-free. Option to apply Automatic Mesh Refinement, which removes the guess work of finding the optimal mesh and gives feedback on the quality of current mesh as well as the proposed refinement. For more information on the Automatic Mesh Refinement, visit the article posted on Engineering.com. 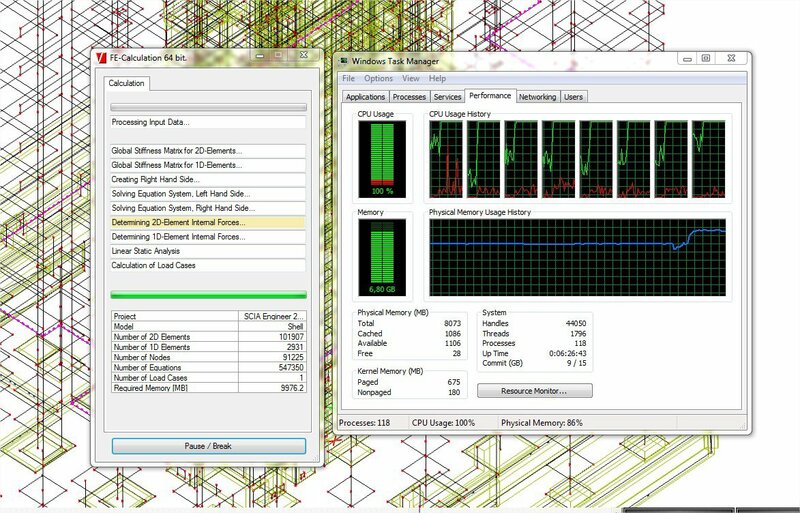 ﻿With full support for 64-bit processors and multiple cores, SCIA Engineer's finite element solver is one of the fastest around. 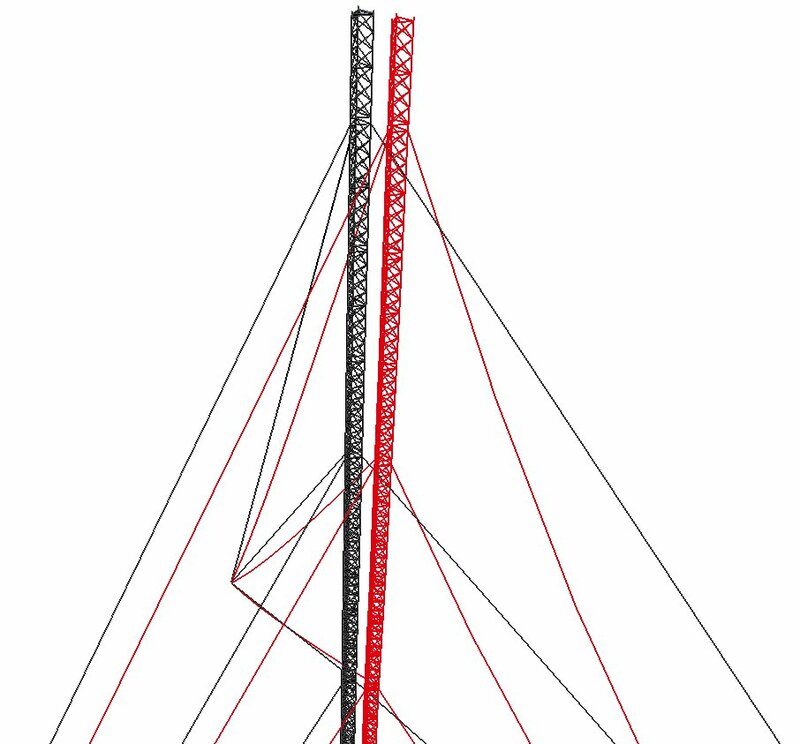 Even complex structures or high-rise buildings that have large non-linear or dynamic calculations will not keep you waiting for long - allowing you to run more iterations of your design in less time. 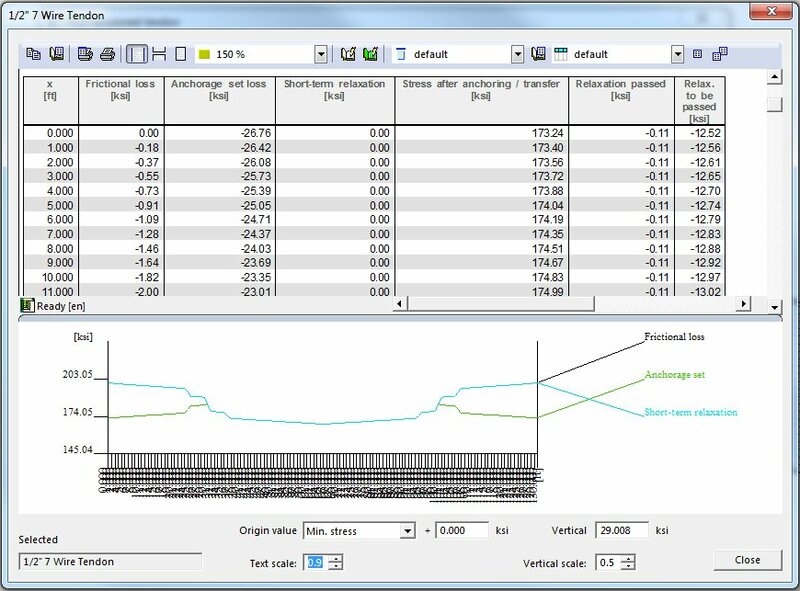 ﻿In addition to standard eigenmode analysis to determine the eigen frequencies and mode shapes, SCIA Engineer allows you to run all standard types of dynamic analysis and then some: earthquake analysis through modal superposition, harmonic (sinus) loads, Von Karman wind on tubes and full time-history analysis with definition of time functions for loading. Additionally, the Improved Reduced System (IRS) method vastly reduces the number of eigenmodes that need to be considered for an earthquake analysis, thereby eliminating local modes and increasing the overall speed and accuracy of the calculation. Gradual application of loads and prestressing. Removal of temporary structural elements. 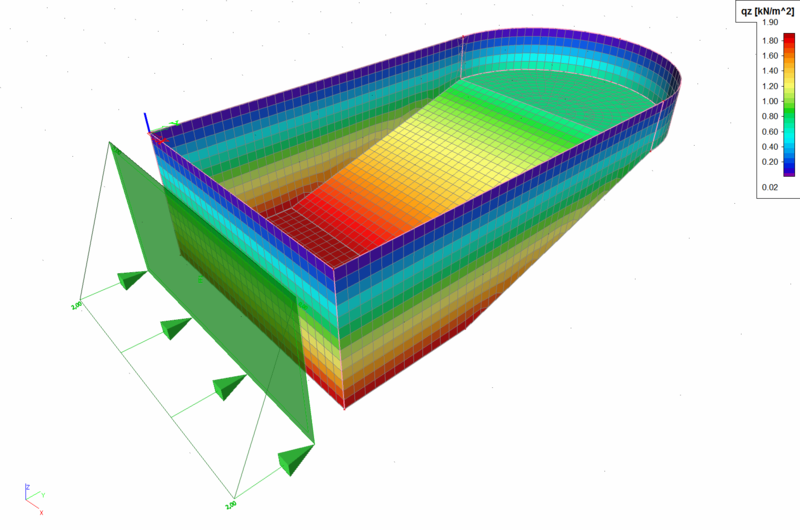 Use of deformed shape from previous stage using nonlinear functionality. In addition, the E-modulus of materials can follow a user-defined time function, to take into account creep or other long term effect. Concrete non-linearity can be considered through a physical non-linear analysis taking into account redistribution due to precise behavior laws of conrete and reinforcement. ﻿Deformations and stresses play a vital role in determining whether or not a structure was modeled properly and behaves as expected. As a result, SCIA Engineer provides extremely precise visualization of these results, on the initial or the deformed shape, displaying results on each fibre of a 1D cross section and on both faces of a surface - thereby giving the user an in depth look into the performance of the structure. ﻿Since there is not a standard way to display results that is optimal for all situations, SCIA Engineer gives users unmatched flexibility in the display of results. In specific, users can utilize results with: different types of coloring, flexible diagrams, filtering/selection tools and adaptable text labels/fonts in order display output that is unique to the needs of the project. 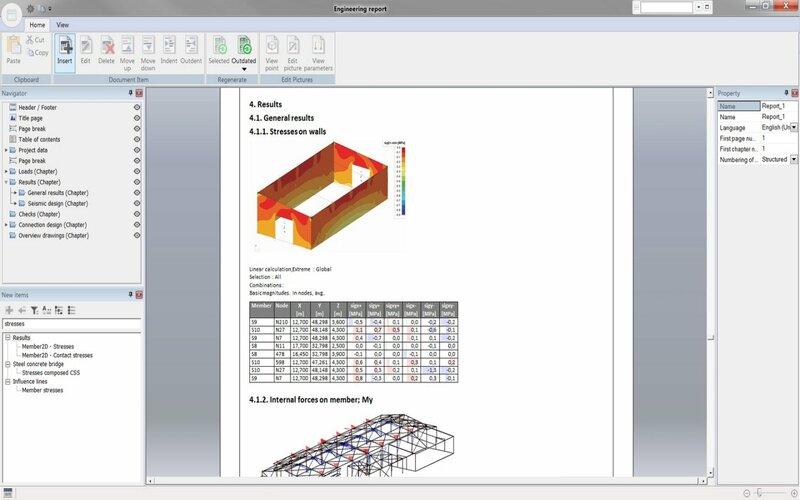 ﻿Concrete member design in SCIA Engineer combines the best of an integrated FEA solution and straightfoward hand calculations in order to offer a high level of productivity without the need to worry about transferring data to other external software. ﻿Perform section design of steel members according to EN1993 and AISC 360-10 as well as a wide range of legacy codes. 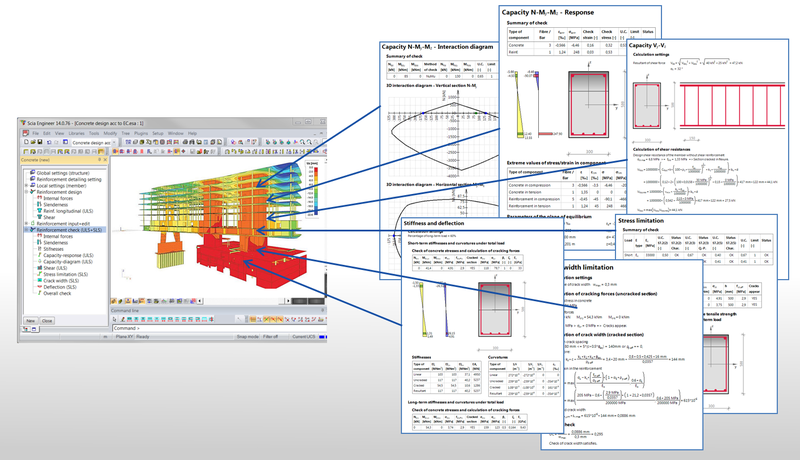 Member design includes Autodesign of a very wide range of profile library cross sections as well as built-up or arbitrary profiles. 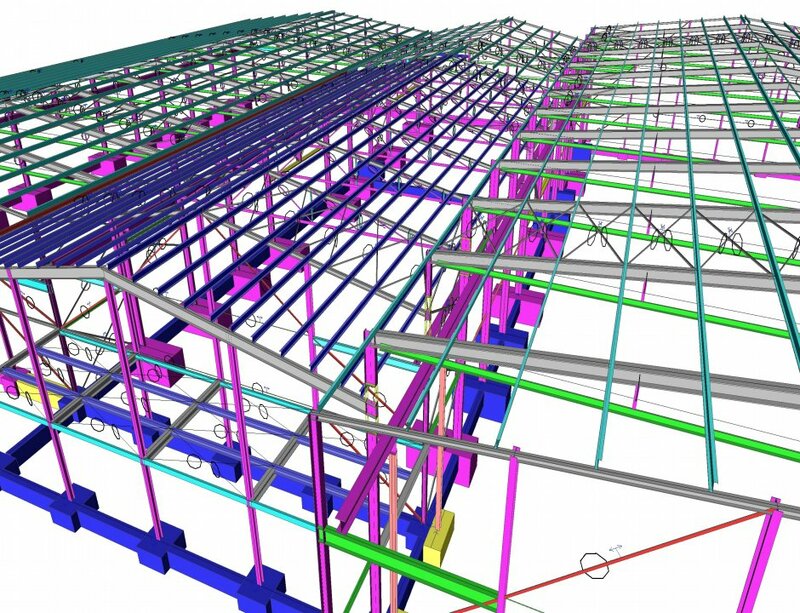 Additionally, Open Web Steel Joist design is supported using the Steel Joist Institutes new virtual joist methodology, allowing engineers to incorporate member stiffness in the overall building model. All necessary effects are also considered: section resistance to normal forces, bending, shear, buckling, torsional buckling, lateral-torsional buckling, local buckling, etc. Additionally, buckling lengths are automatically determined and can be reviewed graphically and numerically. 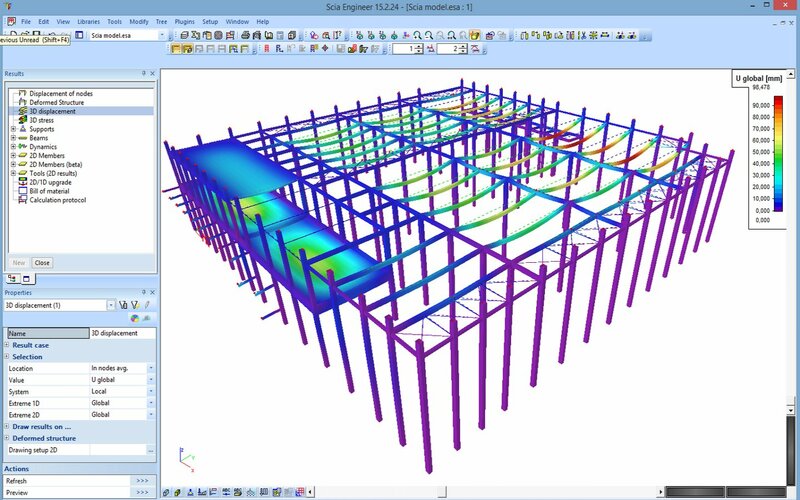 ﻿SCIA Engineer provides users the unique ability to model steel connections within the 3D model. Connections can be defined as either rigid, pinned or diagonal with various plates, bolts, stiffeners, haunches and welds defined. 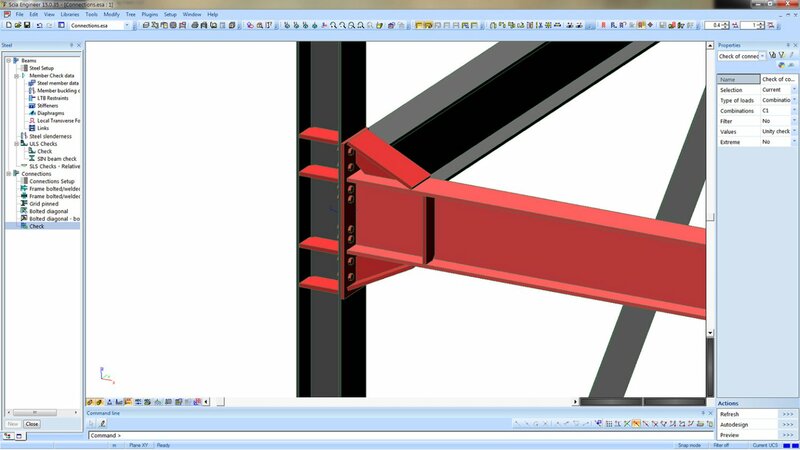 Once a connection is fully modeled, its stiffness can be determined and then used as a hinge type in the larger building model. 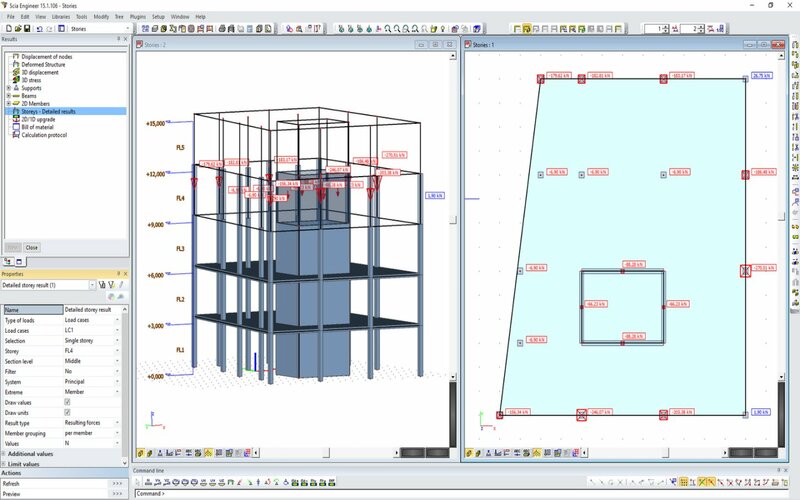 Additionally, with the implementation of SCIA Design Forms, users can apply specific connection types to FEA nodes in order to execute a full limit state design with dynamic graphics and fully transparent output. Timber (EN1995): section and stability checks of timber beams. Includes special checks for creep, variable height and curved elements. Aluminum (EN1999): standard and custom aluminum profiles can be defined and checked. Includes calculation of effective properties, influence of heat affected zone. Scaffolding checks according to EN 12810 and EN 12811: tube & fittings or system scaffolds are fully supported. ﻿Fully integrated solution for modeling, analyzing, designing and reporting prestressed and post-tensioned 1D and 2D members. SCIA Engineer allows users to complete both linear and time dependent analysis in order to accurately achieve results over the life of the structure. Additionally, design checks according to EN 1992-1-1 & EN 1992-2 are included while design verification for ACI 318-14 is currently in development. ﻿SCIA Engineer performs the analysis and design of structures containing cold-formed steel elements; the thin-walled members can be assigned both standard and elaborate (user-defined) cross-section shapes. Derivation of effective shape for arbitrary members, taking into account local buckling and distortional buckling of internal and edge stiffeners. Overall design includes allowances for shift of neutral axis, use of average yield strength and steel core thickness. Specialized purlin design includes the derivation of free flange geometry, advanced loading determination, etc. ﻿The Engineering Report is an integrated documentation platform that allows users to create detailed calculation reports with table of contents, model input, loading, analysis and design results as well as model views and graphics. Items added to the report are available in the navigator, allowing for simple user modification. Additionally, since the report is dynamically linked to the model, all items will regenerate automatically to reflect recent changes. ﻿Templates allow users to save custom report layouts (including all results and graphics settings) in order to accelerate the creation of everyday reports. ﻿Exporting from the Engineering Report to Word, Excel or PDF (including 3D PDF) makes finalizing and sharing reports straightforward. Automatic creation of plan and section views of the structure according to predefined building stories and line grid planes. Views and sections can be added to customizable layout pages which can include labels, dimensions, additional graphical model views and table results. All drawings are directly linked to the model and therefore will automatically update after any model modifications. Drawings can be exported to PDF or other image based file types, while also being saved as DWG, DXF or VRML files for use in other BIM/CAD tools. 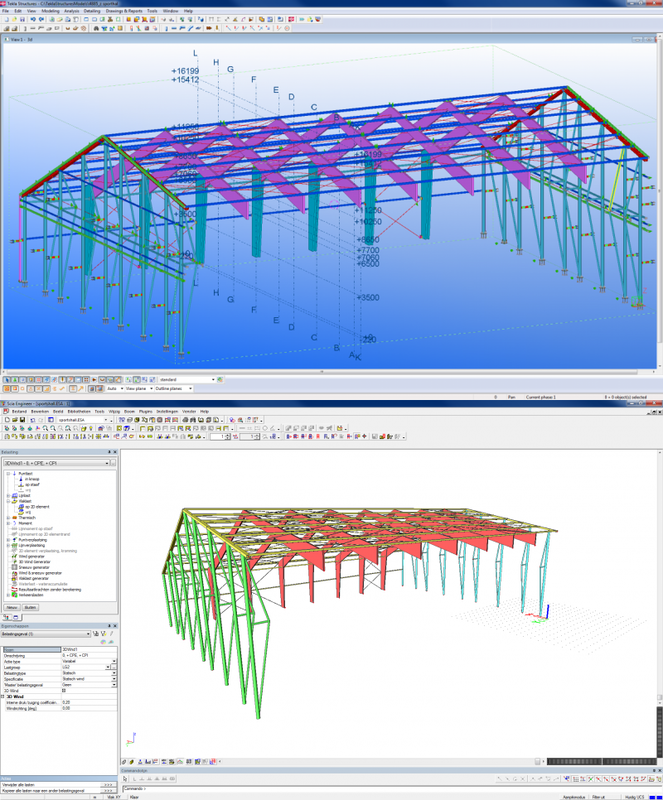 ﻿As a co-founder of the Open BIM Program, SCIA Engineer was the only structural analysis software to implement import and export support for the IFC 2x3 format. Because of this, it is possible to exchange data utilizing IFC (Industry Foundation Class) files with over 150 different BIM offering tools, making the OpenBIM workflow the most rubust and flexible interoperability solution on the market. Thanks to these tools, a workflow based on IFC becomes not only possible, but practical as well. All types of geometry and materials: slabs, floors, walls, shells, beams, columns and bracing in a variety of materials (steel, concrete, timber) either straight or curved. ﻿An emerging workflow, particularly among high end designers, is utilizing Rhino and Grasshopper to create complex geometry. There is a number of ways that this data can easily be plugged into SCIA Engineer. 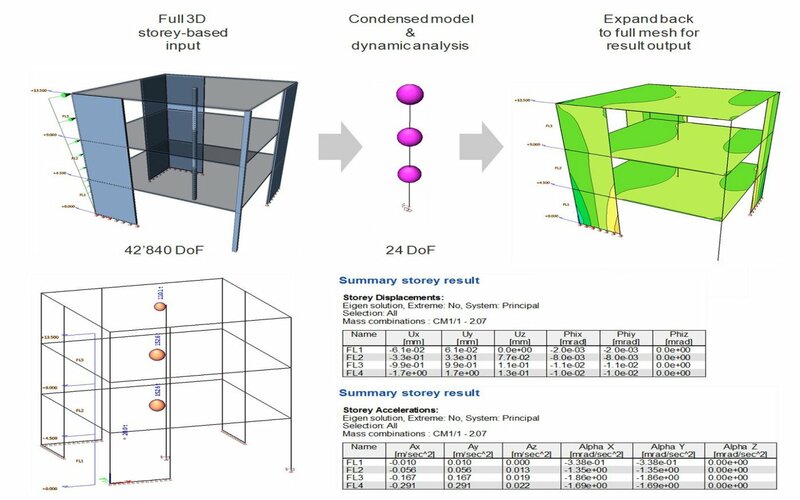 Complex 3D geometries can be imported into SCIA Engineer where they can be easily converted into analytical members, loaded, analyzed and designed. 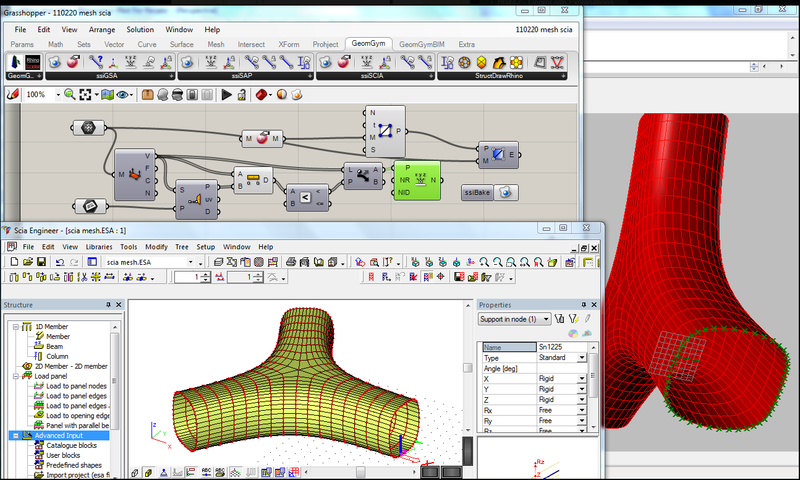 Text based output from Rhino can be copied and pasted into SCIA’s tables for automatic model generation. This can be be made more robust with the use of XML. 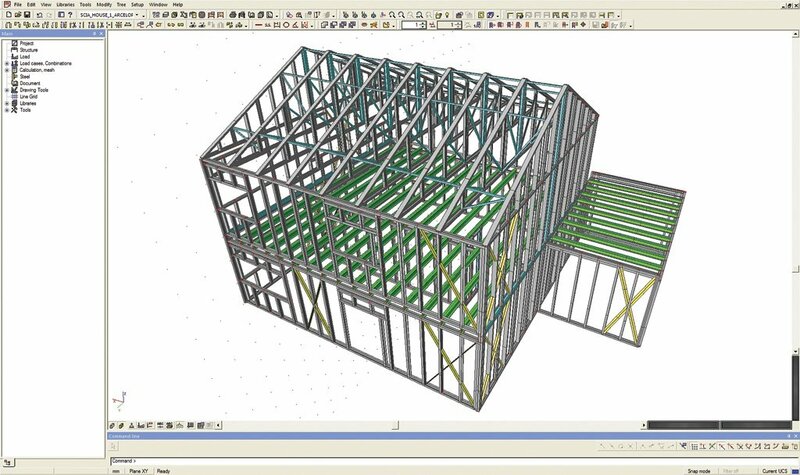 There are a number of Grasshopper plug-ins that allow you to connect directly to SCIA Engineer, as well as complete workflows for linking Grasshopper, SCIA Engineer and Revit through Dynamo. For more information on these emerging workflows, feel free to contact us. 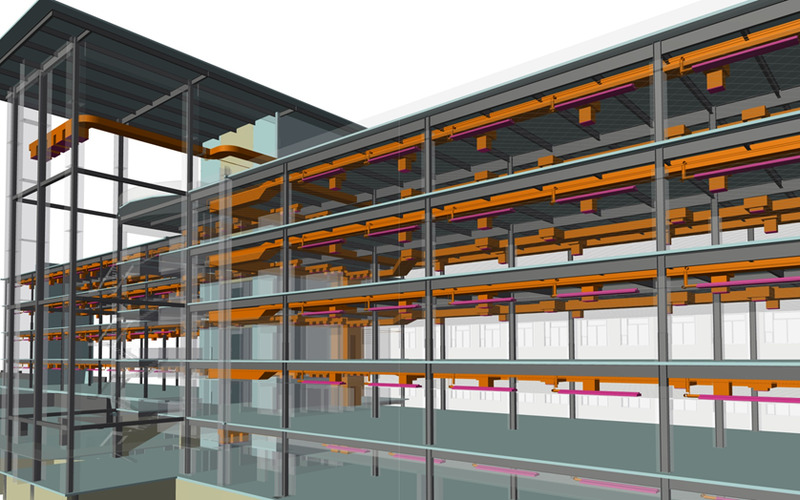 ﻿SCIA and Tekla are both part of buildingSMART alliance’s Open BIM initiative and promote IFC as the preferable format for data exchange of 3D structural models. In addition SCIA Engineer offers a bi-directional link that makes it easy exchange of steel models. 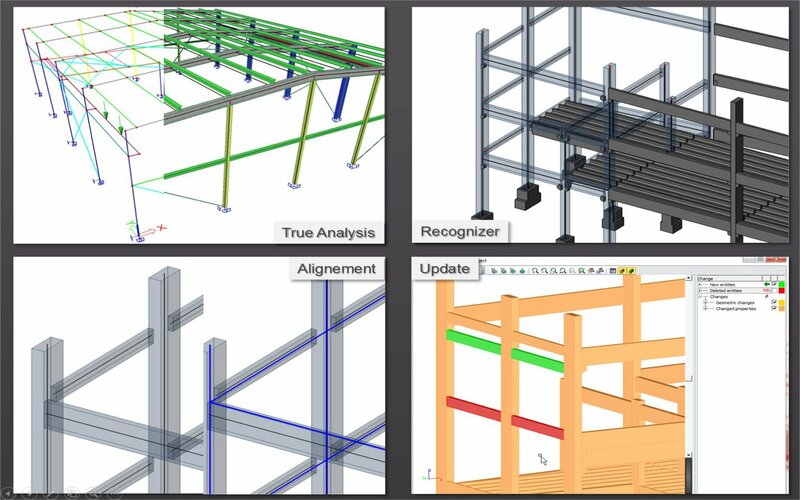 Steel structures and components can be easily modeled in SCIA Engineer, analyzed and optimized, then sent to Tekla for final documentation and detailing. Reversely, models created in Tekla can be pushed to SCIA where the design can be optimized and then pushed back to Tekla for final documentation. 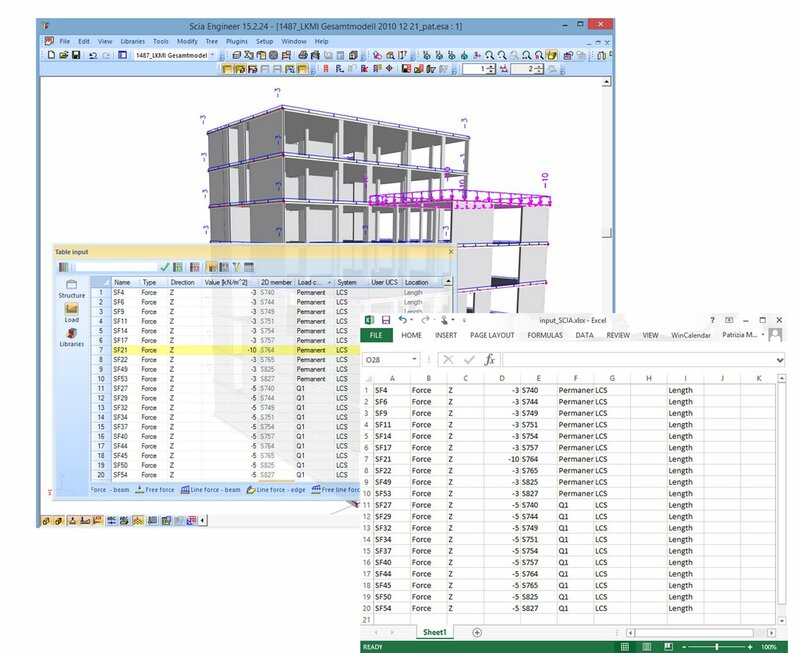 ﻿Based on the Open BIM workflow approach and with the high-level IFC support of both Allplan Engineering and SCIA Engineer, models can be sent to and from both software with ease. Furthermore, reinforcement can be designed in SCIA Engineer to be further detailed in Allplan Engineering, or modeled in Allplan Engineering to be verified in SCIA Engineer.